If you saw Torch Theater's production of Boeing Boeing in 2015 (the year that Gremlin and Torch had a mini-residency at the Theatre Garage), Don't Dress for Dinner will seem very familiar, in a good way. More than 20 years after writing Boeing Boeing, French playwright Marc Camoletti returned to the formula that worked so well the first time - a couple of friends named Bernard and Robert, the latter visiting the former who has some crazy scheme involving mistresses, secrets, and doors (as I've noted before, more doors = more funny). 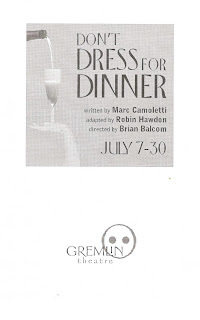 While Boeing Boeing is set squarely in the '60s, Don't Dress for Dinner premiered in the late '80s/early '90s so it feels more modern, and this production appears to be set in the present day. This time, Bernard is married to Jacqueline, and invites his mistress Suzanne and old friend Robert (who, unbeknownst to him, is having an affair with Jacqueline) to visit for the weekend. He's also booked a cook named Suzette for the weekend... and you can probably see where this is going. Mistaken identities, lies, cover-ups, and frantic maneuverings on the men's part to keep this weekend from collapsing into disaster all add up to a crazy fun ride. The craziness happens on a set (designed by Gremlin's Technical Director Carl Schoenborn) that looks every bit the chic and modern home in a converted barn (my new favorite word is piggery), including three rustic doors and an exit upstairs to the hayloft. Under the crisp direction of Brian Balcom, this fantastic cast plunges head-first into the comedy, sometimes literally, as things get pretty physical at times, leading the characters into... compromising positions. Artistic Director Peter Christian Hansen is charming and smarmy as Bernard, the mastermind behind the sordid weekend. Grant Henderson is an adorably frazzled Robert, shocked at what his friend has gotten him into but helpless to prevent it. Melanie Wehrmacher is strong as the cheating wife who also manages to be upset that her husband is also cheating. As the mistress Suzanne who's asked to pretend to be the cook, Sierra Schermerhorn is seductive and pouty, while Mike Dolphin impresses as the other Suzie's husband, incredulously making his acting debut in this play. The whole cast is playful and game for anything, but perhaps my favorite is Maeve Moynihan as the tough-talking cook Suzette. The little girl who played Carrie in the world premiere of the Little House on the Prairie musical at the Guthrie nearly ten years ago is all grown up, but hasn't lost that unique spark that makes her irresistible onstage. Don't Dress for Dinner is escapist entertainment, perfect for a warm summer night, especially when paired with a visit to the Lake Monster taproom (check out their food truck schedule). It's a play that brings to mind the famous quote, "fasten your seat belts, it's going to be a bumpy night." What may be a stressful evening for the characters involved is a whole lot of fun for the audience. 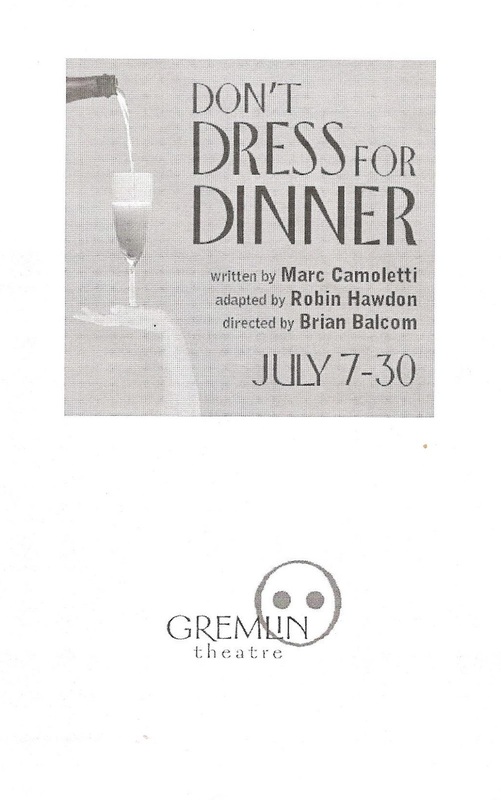 Don't Dress for Dinner continues Thursdays through Sundays through the end of the month (discount tickets available on Goldstar).